In bible, the only people mandated to wear a head covering were the priests when they were ministering in the Temple – the high priest wore a mitznefet, a kind of mitre, and the ordinary priests a migba’at, which is often translated as a turban. By Talmudic times it was clearly an option for men to cover their heads, though women were less free not to do so (“Men sometimes cover their heads and sometimes not; but women’s hair is always covered, and children are always bareheaded.” Nedarim 30b). Children were also not always bare headed – there is a story in Tractate Shabbat about R. Nachman b Isaac whose mother was told by astrologers, Your son will be a thief. [So] she did not let him [be] bareheaded, saying to him, ‘Cover your head so that the fear of heaven may be upon you, and pray [for mercy]’. Head covering today has become de rigueur for religious Jews. While there is not only no biblical source, there is not even a consensus from the medieval commentators and codifiers as to when and where it is appropriate or necessary to wear kippah, and yet – Jacob went out, and he must have been wearing a hat. The headcovering in modern times is a signal to others of Jewish status, and a badge that declares the political and denominational attachments of the wearer. The language of head coverings is almost as complex and nuanced as the old fashioned language of flowers. Do you wear a kippah nearer the front or nearer the back of the head? Is it suede or crocheted, satin or velvet or cotton? Is it large or small? Decorated or plain? Black or with colours? Do you use obvious hairpins or Velcro? Do you wear a hat over your kippah? A baseball cap? A streimel? People will know from these small differences if you are a Zionist, a yeshiva bochur, traditional religious, frum, progressive, chareidi….. They will be able to tell whether you are from old school traditions, or follow a more modern line. Your kippah will pigeon hole you in the Jewish world quicker than your accent will betray your class in the UK. And then of course there is the modern phenomenon of people wearing their allegiances not so much in the coded way of material/size/colour/placement – we now have the rise of the kippah decorated in the colours of the football team of your choice, with their crest and logo, with the name of the team worked around the edge. This version of wearing the heart on the sleeve leads to some pretty robust conversations between young men as they scorn the team whose colours and brand is worn with pride by their friend. The covering of the head, so unnecessary in biblical times except for the active priesthood, but taken up by some in Talmudic times as an act of piety and in order to remind the wearer of the presence of God, to inculcate a sense of ‘yirat shamayim/ awe of heaven’ has become not so much a prop for spiritual awareness as a prop to advertise to others something less than spiritual. Be it adherence to a particularly introverted and orthodox sect or to show a particularly secular passion for team sports, it now functions as a flag of identity. There used to be an advert in the UK in the 1930’s which famously stated “if you want to get ahead, get a hat” It was written by Charles Sydney Catlin, who had apparently showed this statement mocked up as a poster in a job interview. He didn’t get the job, but somehow his slogan found its way into the world of headgear advertising, and he used the story as a reminder of the importance of safeguarding one’s work. The story resonates with the story of headcoverings in Judaism. 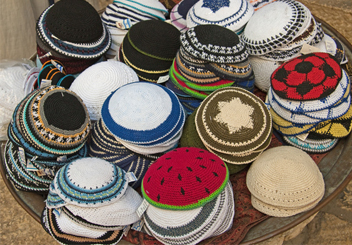 Just as the really important reason for wearing kippah is as a reminder to the self of context in the world, that there is a Divine presence who sees everything and notices everything – yet it has become a way of signalling one’s identity to others, and the awe of heaven is often far from the consciousness of the regular kippah wearer, so the cleverness of the slogan and its focus on appropriate head gear in order to ‘fit in’ has overlaid the history of the man whose work was taken from him without credit. We see the surface, we forget the deeper meanings and truths that the surface is pointing to. We signal to others about our affiliations and forget to signal to ourselves the one important affiliation – to fulfil the covenantal relationship with the ever living God.